Genepax has Unveiled a Car that runs only on Water as Fuel! Genepax, a Japanese venture company has unveiled a car that runs on water as Fuel. All it requires is a litre of water. 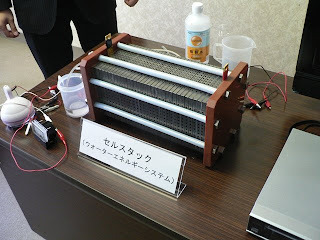 In fact, any kind of water to be exact, whether its river, rain, sea water, or even Japanese tea sounds funny, ofcourse that's cent percent true..
Genepax Co Ltd explained the technologies used in its new fuel cell system "Water Energy System (WES)," which uses water as a fuel and does not emit CO2. "The main characteristic of this car is that no external input is needed. The car will continue to run as long as you have a bottle of water inside for you to add from time to time," said Kiyoshi Hirasawa, Chief Executive Officer of Genepax, after he proudly announced the company's invention. As per the claims it runs only on a 300W "Water Energy System (WES)" where WATER is the only FUEL. Once water is poured into the water tank at the back of the car, the newly invented energy generator takes out the hydrogen from the water, releases electrons and finally generates electrical power. According to Genepax, the main feature of the new system is that it uses the company's membrane electrode assembly (MEA), which contains a material capable of breaking down water into hydrogen and oxygen through a chemical reaction. 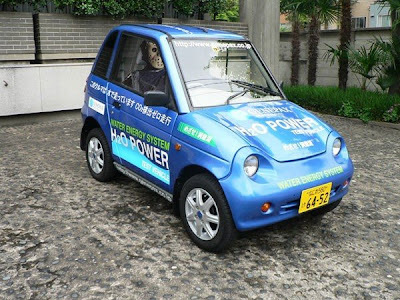 "We highly recommend our system since it does not require you to build up an infrastructure to recharge your batteries, which is usually the case for most electric cars," said Hirasawa, who is hoping to advertise the car in time for the upcoming G8 Summit in Hokkaido, Japan. According to the company, 1 liter of water keeps the car running for about an hour with a speed of 80 kilometers or 50 miles an hour. The company has applied for a patent and is hoping to collaborate with Japanese automobile manufacturers to mass manufacture their invention in the very near future. As fuel prices continue rising and people look for greener alternatives, companies globally are trying to come up with alternatives. With the new process, the cell needs only water and air, eliminating the need for a hydrogen reformer and high-pressure hydrogen tank. Moreover, the MEA requires no special catalysts, and the required amount of rare metals such as platinum is almost the same as that of existing systems, Genepax said. Unlike the direct methanol fuel cell (DMFC), which uses methanol as a fuel, the new system does not emit CO2. In addition, it is expected to have a longer life because catalyst degradation (poisoning) caused by CO does not occur on the fuel electrode side. As it has only been slightly more than a year since the company completed the prototype, it plans to collect more data on the product life. At the conference, Genepax unveiled a fuel cell stack with a rated output of 120W and a fuel cell system with a rated output of 300W. 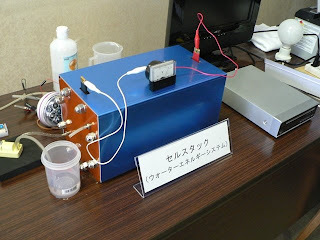 In the demonstration, the 120W fuel cell stack was first supplied with water by using a dry-cell battery operated pump. After power was generated, it was operated as a passive system with the pump turned off. This time, the voltage of the fuel cell stack was 25-30V. Because the stack is composed of 40 cells connected in series, it is expected that the output per cell is 3W or higher, the voltage is about 0.5-0.7V, and the current is about 6-7A. The power density is likely to be not less than 30mW/cm2 because the reaction area of the cell is 10 x 10 cm. Meanwhile, the 300W fuel cell system is an active system, which supplies water and air with a pump. In the demonstration, Genepax powered the TV and the lighting equipment with a lead-acid battery charged by using the system. In addition, the 300W system was mounted in the luggage room of a compact electric vehicle "Reva" manufactured by Takeoka Mini Car Products Co Ltd, and the vehicle was actually driven by the system. Genepax initially planned to develop a 500W system, but failed to procure the materials for MEA in time and ended up in making a 300W system. For the future, the company intends to provide 1kw-class generation systems for use in electric vehicles and houses. Instead of driving electric vehicles with this system alone, the company expects to use it as a generator to charge the secondary battery used in electric vehicles. Although the production cost is currently about ¥2,000,000 (US$18,522), it can be reduced to ¥500,000 ($5,000) or lower if Genepax succeeds in mass production. The company believes that its fuel cell system can compete with residential solar cell systems if the cost can be reduced to this level. NASA has turned to HydroWorx's aquatic therapy pools for help with the conditioning and health of its astronauts. The Johnson Space Center in Houston, Texas is where U.S. astronauts live and train; the facility is working on a project called the Center for Space Flight Performance and Research. This high-tech health center will incorporate HydroWorx hydrotherapy pools to keep its space travelers fit and healthy. Well HydroWorx has specialized in designing, manufacturing and marketing the worlds finest water therapy and conditioning equipment for the home, sports, healthcare, eldercare and fitness markets. The company's core technologies are centered upon maximizing the therapeutic properties of water to accelerate rehabilitation and provide a nearly stress free medium for exercise. The Center plans to include a HydroWorx 1200 Series underwater treadmill pool, a ThermalPlunge hot tub and a PolarPlunge cold tub. The 1200 Series swim spa is a quantum leap forward in aquatic therapy and wellness. Its ground-breaking design allows healthcare professionals with limited space to enjoy the benefits of our aquatic therapy and exercise in a compact package. The entire pool floor is fully adjustable in height, which will allow the astronauts to simply stand or sit on the treadmill while it is flush with the surrounding floor and be lowered into the water. The pool depth can reach 6' within 30 seconds, so the astronauts' coaches and physical therapists can strategically unload 20% to 90% of their bodyweight by raising or lowering the treadmill to manipulate water depth. This comes in handy training for zero gravity. The astronauts will be able to walk or run against resistance jets, which are essential for exercise, therapy, rehabilitation, swimming, or deep tissue massage. These jets are adjustable to up to 200 different water speeds. Attaching a massage hose harnesses the force of a jet into a focused stream, creating a deep, wide band of pressure for subcutaneous, therapeutic penetration and myofascial release. All functions of the HydroWorx pool are computer monitored and will be able to be recorded to validate and track astronaut recovery and progress. The 1200 Series pool will include three underwater cameras and a flat screen viewing monitor which will greatly enhance the NASA therapist's diagnostic capabilities when evaluating an astronaut's underwater gait pattern. NASA's awareness of the benefits of hot and cold water therapy prompted their purchase of the other HydroWorx pools for the facility. The hot water (94º- 110º) and cold pools (50º) will allow U.S. astronauts to speedily recover from strain and exercise. Strategic pool jets can be positioned in any configuration for soothing massage or trigger point patterns. Attaching a massage hose harnesses the force of a jet into a focused stream, creating a deep, wide band of pressure for hot or cold subcutaneous, therapeutic penetration and myofascial release. The thermal heating units are engineered to distribute warm or hot water to relax tight muscles and stimulate the release of endorphins. This will aid astronauts in stretching and warming-up pre-activity or soothing tired muscles post-activity. HydroWorx's Polar Chiller systems maintain water temperatures at a therapeutic 50º to control joint inflammation and enhance recovery by constricting muscle fibers to pump out lactic acid. With the addition of HydroWorx aquatic therapy pools in the Center for Space Flight Performance and Research, NASA's astronauts' fitness and health should be out of this world. HydroWorx specializes in designing, manufacturing, and marketing the world's finest water therapy and conditioning equipment for the home, sports, healthcare, eldercare, and fitness markets. The company leads the industry in scientific research and data supporting the therapeutic and rehabilitative properties of hydrotherapy. HydroWorx has sold residential pools and professional aquatic therapy pools in all 50 states and twelve countries. HydroWorx's extensive and elite client list includes Dr. James Andrews and Dr. Richard J. Hawkins, renowned orthopedic surgeons, the, the University of Texas, USC, LSU, Ohio State, as well as Nike, the San Antonio Spurs, and Notre Dame. European Cup champs Manchester United Football Club and the Super Bowl champion New York Giants are also among hundreds of other distinguished customers. Ergonomically Speaking, Computer Furniture Doesn't Get Any Better Than This from Versa Tables. It's no mystery that for the past decade Versa Tables has been manufacturing and selling some of the most durable, functional computer furniture available on the market today. 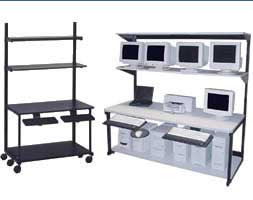 With several lines of computer desks and tables filling classrooms, computer labs, and training centers across the country, the quality of Versa Tables has never been in question. 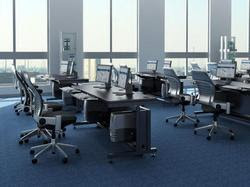 Due to the increasing length of time that people are spending at their desk in front of a computer, though, ergonomics has become one of the biggest concerns when it comes to choosing the very best computer furniture. "When we design and manufacture computer furniture at Versa, we keep three main points in mind; functionality, durability, and ergonomics", remarked Chris Stormer, Chief Operations Officer at Versa Tables. "All three issues are of the utmost importance to us, but ergonomics often takes the most time and effort due to the ever changing way people are incorporating computers and new technology into their lives. The ergonomic standard for keyboard trays in 2001 may be different than the standard of today, and we are able to incorporate those changes into our designs as they happen. That's one of the most unique aspects of our company. We are flexible enough to shift with the market and always be one step ahead of the competition." 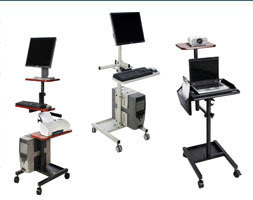 As one of the top suppliers of computer desks and tables to universities and military training centers in the United States, Versa Tables has a lot of pressure to perform. It's not just a demand from the public to produce ergonomically correct products that appeal to the market, it's meeting and exceeding some of the most stringent testing guidelines governing the manufacturing sector in the U.S. The ANSI / BIFMA Safety and Performance Guidelines are developed by the Business and Institutional Furniture Manufacturing Association Engineering Committee. The standards are reviewed every five years according to guidelines established by the American National Standards Institute (ANSI). The standards are intended to provide manufacturers, specifiers, and users with a common basis for evaluating safety, durability, and the structural adequacy of the specified furniture, independent of construction materials. The standards define specific tests, laboratory equipment to be used, the conditions of test, and the minimum acceptance levels to be used in evaluating these products. "All Versa Tables products meet or exceed ANSI / BIFMA testing guidelines", mentioned Stormer. 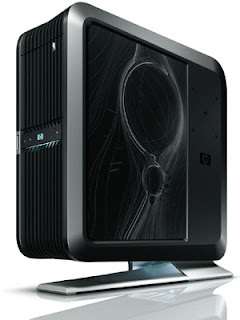 "Not many people who are in the market for computer furniture even know what that means, so a lot of our competitors don't even bother to spend the time and money it requires to achieve these standards. It matters to us though. Knowing that are customers are getting furniture that not only meets their needs, but is the best when it comes to safety, structural integrity and ergonomics makes every painstaking hour and dollar spent 100% worth it for us." In a landscape riddled with cheap knockoffs and foreign-import substandard furniture, American made tables and desks from Versa Tables are a breath of fresh air. When evaluating your next purchase of computer furniture, it's a good idea to use the focus on the same three points that Versa does; functionality, durability, and ergonomics. Well the price of oil at an all-time high, car owners around the world are searching for ways to save money on gas. A new report teaches car owners how to run a combustion engine car or truck on water, saving huge money at the gas pump. View this video describing technology involved. Oil is the lifeblood of America's economy. Americans drive and fly more than any other nation in the world, contributing to rising oil prices. America uses a full 25% of the world's oil, mostly for transportation. Much of the U.S. oil supply comes from overseas sources, making the U.S . dependent on other nations to supply the lifeblood of the transportation system. According to the U.S. Department of Energy, the remaining U.S. oil fields are becoming increasingly costly to produce because much of the easy-to-find oil has already been recovered. With some industry experts predicting prices will top $500 for a barrel of oil within a few years, it appears there is no end in sight for gas price increases, making it all the more important to find alternative fuel sources, such as water. The combination of swelling oil prices, a slowing global economy, and increased unemployment, are causing car owners to explore alternatives to spending money on new, more energy-efficient cars. While water has long been considered as an alternative fuel source, without the recent rise in gas prices, car owners were not motivated to explore the technology. 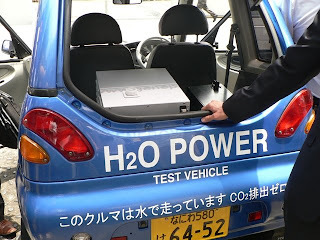 The technology behind using water to run a car includes using the battery in your car to take water and separate it into "HHO," which stands for Hydrogen, Hydrogen, and Oxygen. This gas burns very effectively and keeps the power of the Hydrogen, but it stays stable, just like water. Only a small amount of water is needed, since a lot of HHO gas can be made from just a quart of water. This gas is actually more potent than regular gasoline, so it can also enhance most cars' performance and improve gas mileage. American's are reluctant to give up their gas-guzzling SUVs, so must seek ways to reduce their gasoline costs. According to the Energy Information Administration "Record crude oil prices are pushing current and expected gasoline prices to record levels." And predictions show no slowing of the upward trend in gas prices, affecting every part of the world economy. Learning to run a car on water is an option whose time has come. Dual-link DVI ports support up to 2560 by 1600 pixels.